The sun has gone quiet. Almost too quiet. A few weeks ago it was teeming with sunspots, as you would expect since we are supposed to be in the middle of solar maximum-the time in the sun's 11-year cycle when it is the most active. But now, there is hardly a sunspot in sight. In an image taken Friday by NASA's Solar Dynamics Observatory, there is a tiny smidgen of brown just right of center where a small sunspot appears to be developing. But just one day before, there was nothing. It was a totally spotless day. So what's going on here? Is the "All Quiet Event" as solar physicist Tony Phillips dubbed it, a big deal, or not? "It is weird, but it's not super weird," said Phillips, who writes about solar activity on his web site SpaceWeather.com. "To have a spotless day during solar maximum is odd, but then again, this solar maximum we are in has been very wimpy." Phillips notes that this is the weakest solar maximum to have been observed in the space age, and it is shaking out to be the weakest one in the past 100 years, so the spotless day was not so totally out of left field. "It all underlines that solar physicists really don't know what the heck is happening on the sun," Phillips said. "We just don't know how to predict the sun, that is the take away message of this event." Sunspots are interesting to solar observers because they are the region of the sun where solar activity such as solar flares (giant flashes of light) and coronal mass ejections (when material from the sun goes shooting off into space) originate. They are caused by highly concentrated magnetic fields that are slightly cooler than the surrounding surface of the sun, which is why they appear dark to us. Those intense magnetic fields can get twisted up and tangled, which causes a lot of energy to build up. Solar flares and coronal mass ejections occur when that energy is released in a very explosive way. 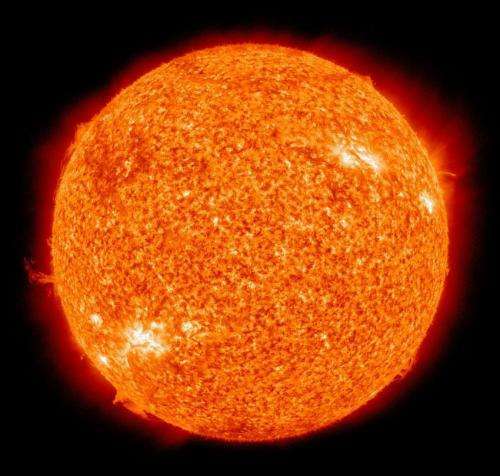 Alex Young, a heliophysicist at Goddard Space Flight Center, said it is hard to say what is and isn't unusual when it comes to the sun. "We've only been observing the sun in lots of detail in the last 50 years," he said. "That's not that long considering it's been around for 4.5 billion years." And it's not like astronomers have never seen the sun this quiet before. Three years ago, on Aug. 14, 2011 it was completely free of sunspots. And, as Phillips points out, that year turned out to have relatively high solar activity overall with several X-class flares. So in that case, the spotless sun was just a "temporary intermission," as he writes on his web site. Whether this quiet period will be similarly short-lived or if it will last longer remains to be seen. "You just can't predict the sun," Phillips said. Sunspot numbers going down is not surprising considering we're approaching a solar grand minimum. The sun's activity as a whole has been dwindling for some time, leading to not only reduced sunspots, but climate extremes on our planet. There's also speculation that a solar grand minimum is what causes the ice ages our planet has experienced several times throughout its existence. "There's loads more work to do in order to fully understand where these particles end up and how they influence lightning but if we can understand this effect, there is the tantalising possibility that we could use our observations of solar wind streams from space to forecast the severity of lightning events several weeks in advance." We still haven't reached polar flip in this cycle...it should have happened at some point by now....seems to be right on the edge. Definitely something going on. It should be noted that we are also seeing atmospheric changes never witnessed on other planets in our solar system as well. Drastic in fact compared to climate events here on earth. What's it matter about anything going on with the sun? I thought the 1998 Hockey Stick Crowd had proven the sun has nothing to do with weather patterns on earth? Now they're concerned about it, and so much so the HSC on this site has swarmed en masse to the one star vote. Just one question HSC, have any of you ever seen a "differential equation" you could solve? Those who use the transistor analogy of the solar surface doesn't see this action as being as eerie as the solar physicists above see it. Good thing the sun has no affect on our climate. You will continue to receive one star votes if you continue to post irrelevant nonsense. No where in the article is the earth's climate mentioned. The article is strictly about the physics of the sun and it was only the denier camp of idiots and losers making the leap to a climate change connection. Wow. Did you guys even read the article or do you just like the pretty pictures? "The activity of the sun may have more of an influence on lightning storms on Earth than was previously thought, a new study suggests. Researchers at the University of Reading in England found that when an especially fast-moving solar wind washed over the Earth, there was a corresponding uptick in the number of lightning storms recorded on the planet." "So what's going on? The researchers can't say for sure, but one possibility is that charged particles from the sun are riding the wave of these especially fast solar winds. While they don't move quite as quickly as the cosmic rays, they may move fast enough to serve the same function as the cosmic rays with the aid of a speedy push from the solar wind." Sun - Y U DO DIS? "..the pedestrian Sun exhibits a variety of phenomena that defy contemporary theoretical understanding. We need look no farther than the sunspot, or the intensely filamentary structure of the photospheric magnetic field, or the spicules, or the origin of the small magnetic bipoles that continually emerge in the supergranules, or the heat source that maintains the expanding gas in the coronal hole, or the effective magnetic diffusion that is so essential for understanding the solar dynamo, or the peculiar internal rotation inferred from helioseismology, or the variation of solar brightness with the level of solar activity, to name a few of the more obvious mysterious macrophysical phenomena exhibited by the Sun." Another fear monger. The Solar "flip cycle" is not due for another 40,000 years, plus or minus 100,000 years. This kind of gibberish is just like what gives global worming such a bad name. You will continue to receive one star votes if you continue to post irrelevant nonsense. ... Grasping at straws much? ...Wow. Did you guys even read the article or do you just like the pretty pictures? Right again, Rocky ... too many irrelevancies. But, this article is a bit late to the Sunspot counting game. The Solar Sunspot Minimum(s) are being noted and have been noted for several years (suspicious0bservers.org, Old Farmer's Almanac, et al) ... And the subliminal pitch for "more studies" = g'ment funding = Doh! Yes. Apparently there have been several cycles of Sun spot "minimums" in the last 500+ years, often associated with Earth side cooling trends and even mini-ice ages and the freezing over of the Thames River (to cite one example). Did you check your limits before posting ? As early as 40K - 100K makes it ANY time from 60K years ago until the suggested 40K in future. So in essence it could happen any time from now onwards until 140K in the future, isnt that you should be stating plus or minus 100K in respect of the median of in 40K years ?